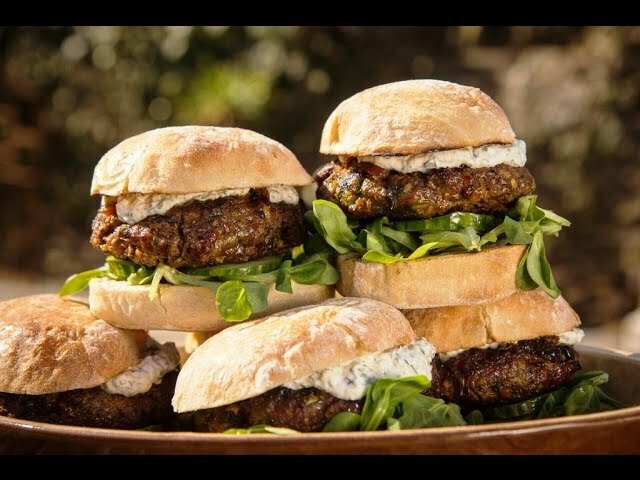 Genevieve Taylor - Moroccan lamb & date burgers with mint & garlic yogurtDelicious juicy lamb burgers are given a sweet and spicy Moroccan twist. Lamb mince is a perfect choice for barbecuing as it’s not too lean so there is no chance of these beauties drying out as they cook. The burgers, shaped and uncooked, freeze brilliantly, so make a double batch and layer some with greaseproof paper before freezing for up to 3 months. If your dates are a touch of the hard side, soak in boiling water for 30 minutes, before draining well and finely chopping. If your dates are nice and soft, you can skip the soaking and just chop. Add to a large mixing bowl along with the rest of the burger ingredients and mix everything together thoroughly, seasoning to taste with salt and black pepper. Divide the mixture into 6 even-size balls and shape into burgers, each around 2cm thick. Place on a large plate, cover and set aside in the fridge for an hour or two, or for up to 24 hours, to allow the flavours to develop. Make the sauce by mixing together the yogurt, mint, garlic and generous seasoning of salt and pepper. Set aside. When you are ready to cook, fire up your barbecue to medium hot. Lay the burgers on the grill bars and cook for around 5–6 minutes on each side until deep golden brown and cooked through. Rest on the warming rack while you toast the rolls. Lay the spilt rolls, cut side down and toast for a minute or two until crisp and lightly charred. To serve, add some lettuce and a burger to the base of each bun, top with a dollop of sauce and top with the lid.